While there aren’t that many complications of dental extractions in Atlanta GA, every once in awhile, a serious condition may develop after you have a tooth removed. One of the more severe complications include getting dry sockets or a condition known medically as alveolar osteitis. What is dry socket syndrome? This syndrome develops when the blood clot, which is formed when a tooth is extracted, is lost from the empty dental socket. This is a problem because in order for healing to properly occur, a blood clot should form in the empty dental socket and it should stay there until the socket has properly healed and closed. The socket is bony and must be protected from external factors, and that is what the blood clot does. What are the signs and symptoms of dry socket syndrome? The signs and symptoms of alveolar osteitis will begin to develop two to five days after the dental extraction. The first thing which patients will feel is discomfort especially in the area of the extraction. The pain can either be mild or severe but there is always a throbbing component. If the pain is too severe, you may feel that the pain radiates all the way to your ear or your eye. You should call Dr. Ballard’s office for advise right away. Looking at the empty socket, you will find that the blood clot, which should occupy the socket, is no longer there. On the other hand, you’ll be able to see bone tissues from the empty sockets. You may also notice a layer of necrotic tissues that have developed on the empty socket. 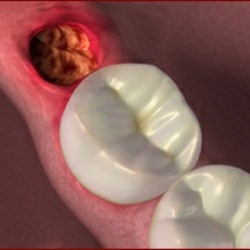 Lastly, the gum tissues close to the area of extraction will appear red and swollen. Other signs and symptoms of the syndrome include a thickening of the lymph nodes close to the site of extraction such as those in your neck. You may also notice a bad odor coming from your mouth which is a result of the necrotic tissues. Finally, fever may also be present. Once the signs and symptoms of the dry socket syndrome have developed, it may take around seven to ten days before the side effects would start to subside. A new granulation tissue must form inside the socket in order for the healing process to become renewed. Basically, having this condition will set back your healing time frame to around a week or two.